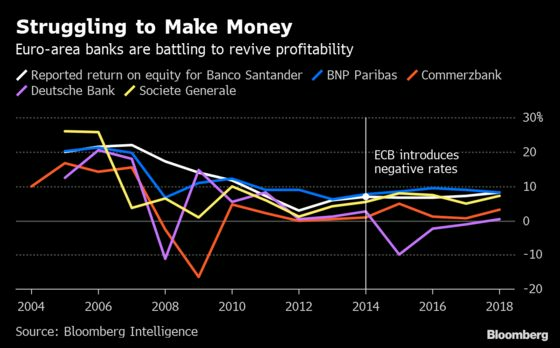 (Bloomberg) -- The European Central Bank looks increasingly set to throw a fresh lifeline to the euro area’s cash-strapped banks, a tacit acknowledgment about the side effects of their aggressive stimulus measures. President Mario Draghi’s hint that the institution may soften the impact suggests officials are now listening to the squeals of banks straining from almost half a decade of negative interest rates. The ECB has previously signaled that it’s keeping an eye on the fallout, but is now being forced into a deeper rethink because of plans to keep rates below zero for even longer. Extending the stimulus is part of its response to an economic slowdown that’s proved deeper than many anticipated. Draghi’s challenge is how to tweak the system without sending the wrong signal: either of watering down the policy or cementing an approach that will push out expectations for interest-rate increases even further into the future. Another complication is how to avoid changes that overly favor one country over another. In any case, the ECB looks increasingly committed to providing a lifeline for banks. In the meantime, the ECB is planning to offer euro-area banks another round of cheap funding if they want it. However, it will probably be less generous than previous rounds, and much of the detail still hasn’t been disclosed. “It’s good that periodically we re-examine the effects on intermediation and therefore on the good transmission of monetary policy of our non-conventional measures, of all our non-conventional measures, including the negative interest rates,” he said in Geneva. A so-called tiering system, where some reserves institutions hold at the central bank are excluded from the penalty of negative rates, has been the typical approach used by other central banks. It’s also one that the ECB previously rejected, partly out of concern on its complexity. When Japan decided to go negative in 2016, it rolled out a three-tier system that effectively excluded most deposits. A zero interest rate and a positive interest rate apply to financial institutions’ current account balances at the Bank of Japan up to certain thresholds. Governor Haruhiko Kuroda said the arrangement was openly designed in a way that would “mitigate a concern over undue impact on financial institutions’ earnings.” That hasn’t stopped banks from complaining. The Swiss National Bank unveiled negative interest rates in December 2014 as part of a last-ditch attempt to save its doomed currency ceiling, which was buckling under pressure from Russian inflows and a weakening euro in the prelude to the ECB’s quantitative easing. The system has two elements. All institutions with a banking license can deposit overnight up to 20 times the minimum capital required of them before having to pay negative interest of 0.75 percent. For other institutions, such as insurers and foreign banks, with sight deposit accounts, the negative rate applies on balances exceeding 10 million Swiss francs ($10 million). More than 50 percent of the deposits with the SNB were exempt from the negative rate as of the end of 2018, while for the ECB it was just 6.2 percent, according to calculations by Maxime Botteron, an economist at Credit Suisse in Zurich. The euro area’s Nordic neighbor first introduced negative rates in 2012 with the aim of weakening the currency. It operates a two-tiered system. Some overnight money can be parked for free at the central bank, but any excess is kept instead in one-week deposits penalized at minus 0.65 percent. 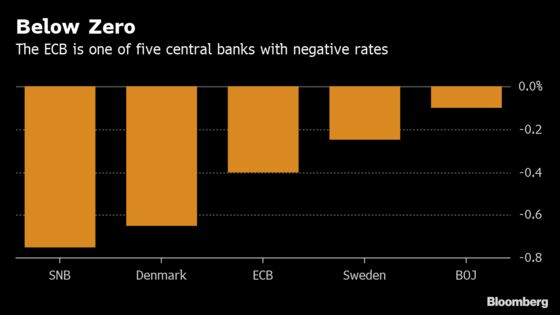 Alongside the ECB, the Riksbank stands out as a proponent of a single-tier negative rate. The country was cited critically in a paper co-written by former U.S. Treasury Secretary Lawrence Summers on negative rates, for the lack of overall transmission of the rate across the economy while it also hurt bank profits. The central bank rejected those findings. Simply raising the deposit rate, currently at minus 0.4 percent, is probably unpalatable for Draghi since it might be seen as a withdrawal of stimulus at a time when the economy is slowing. The ECB could alternatively adapt its newly revamped program of long-term loans for banks to effectively pay them to boost lending to offset the impact of negative rates.